Heritage on wheels. That’s my take on the Ford Mustang. You cannot escape the evidential truth that Ford’s pony car has a great deal of history behind it, while it adroitly advances that legacy with each new model built. More than a half-century has passed since the original Mustang took to the road, but not without a little drama through the intervening years. Indeed, the Mustang’s existence was threatened at least twice over that span, beginning with new federal emissions standards curtailing its potency in the 1970s. In the 1980s, the threat came from within as Ford executives seriously considered replacing the rear-wheel-drive Mustang with a front-wheel drive and Japanese-built Probe. Happily, that desecration did not happen as an enthusiast-led insurgency inflamed by Autoweek forced Dearborn’s hand. Consequently, the fourth-generation Mustang was released in 1994 to critical acclaim, the first all-new model in 15 years. A twist to the Mustang saga came early in the new millennium as the Mustang’s chief rival, the Chevrolet Camaro, was canceled. A rivalry hatched in the late 1960s was gone and with it Ford could have just as easily rested on its laurels or vanquished its steed to obscurity. Fortunately, a new breed of forward-thinking Ford managers was in place and had the tenacity to not just maintain Mustang within the blue oval corral, but to elevate its position. In 2005, a retro-inspired model was released, one that effectively united a modern demeanor with heritage styling cues, while introducing America’s pony car to a new generation of car buyers. That fifth-generation model must also receive credit for forcing GM’s hand to revive the Camaro as well as Chrysler’s decision to bring back the Challenger. Certainly, the Mustang is dream maker all by itself, but with competitors once again nipping at the bridle, its been “game on” ever since. That game is best exemplified by models such as the Mustang GT, the most powerful mainstream stallion. Sure, there are Shelby variants to raise the performance quotient further, but it is the Fastback and Convertible expressions found within the GT, that best represent the models attainable by the masses. 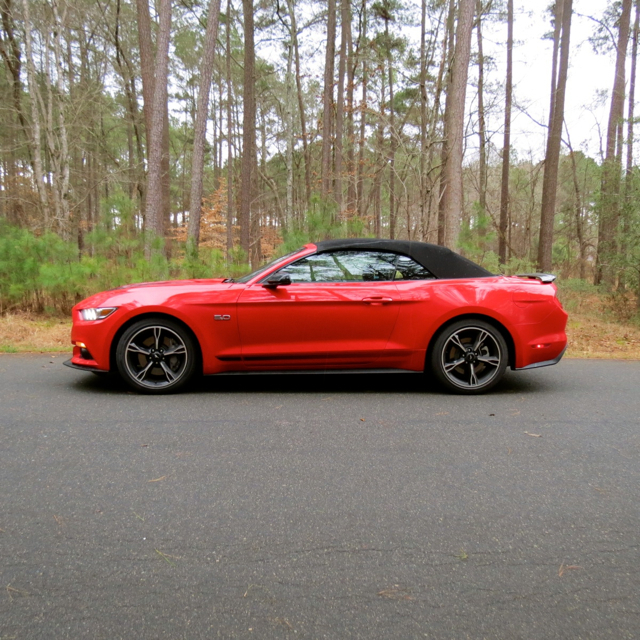 A 2016 Ford Mustang GT Premium Convertible eased into my driveway one chilly February morning, teasing me with its handsome countenance and drop-top possibilities. With one eye admiring its visage and the other eye examining my smartphone for the 7-day forecast, I immediately identified precisely when the top would come down. Never mind that the day would arrive when the temperature barely topped 50 degrees, accompanied by a sharp wind out of the northwest to chill the experience — this was one gift horse that would open its soft top roof to demonstrate its full competence. And that model came in “race red” — the preferred pigmentation for law enforcement personnel in search of victims to add to their ticket writing quota. Fortunately, I avoided a close encounter of the legal kind and managed to execute my own form of foot stomping justice. 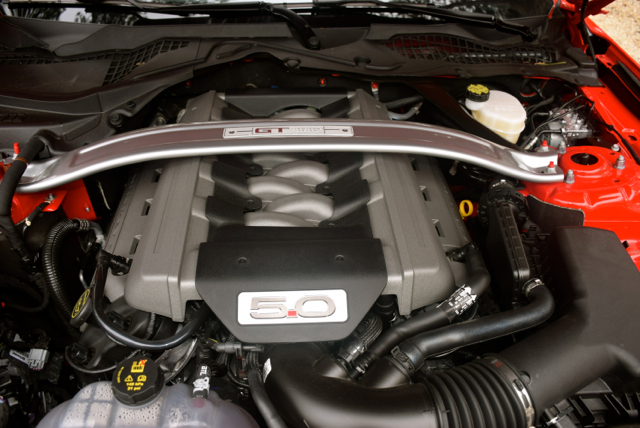 All Mustang GT models are powered by a 5.0-liter, naturally aspirated V-8 engine making 435 horsepower and 400 foot-pounds of torque. The transmission pairings are 6-speed manual or automatic gearboxes — the self-moving slush box was my lot for the week, this model’s only major demerit. 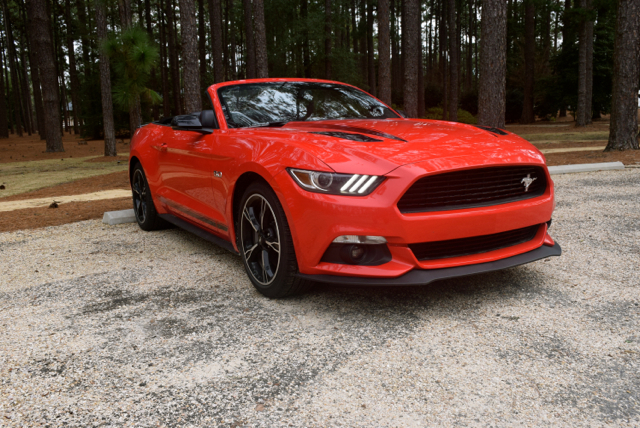 From bumper to bumper, the Mustang expresses joie de vivre. Its frontal presence is at once bold as it is handsome, inviting enthusiasts to slip behind the wheel while warning competitors to move out of the way. The Mustang GT brings in certain embellishments to amplify the steed’s countenance. Introduced in 2015, the 2016 edition adds something fans have been wanting to see return for years — hood vent integrated turn signals. Yes, indeed — at each sharp crease in the hood you’ll see the signals at work, although you’ll have to lean over toward the passenger side to see the right turn signal in action. The said test model was a “California Special” with distinct badging, accent striping, ebony clad wheels, and a deck-lid spoiler. The black accents along with the soft, black roof make for a beautiful contrast with the red patina. Other expected Mustang cues are present, including triple bar LED accent lights up front as well as recognizable rear sequential lighting. Slip behind the wheel and anticipation builds. Before you ignite the engine, carefully scan the layout to take in what is present. A circular theme is apparent from the steering wheel to the dual cowl instrument displays and on to the vents, knobs, speakers, cup holders and to the shifter. There is no need for a flat-bottomed steering wheel to accentuate the steed’s prowess. 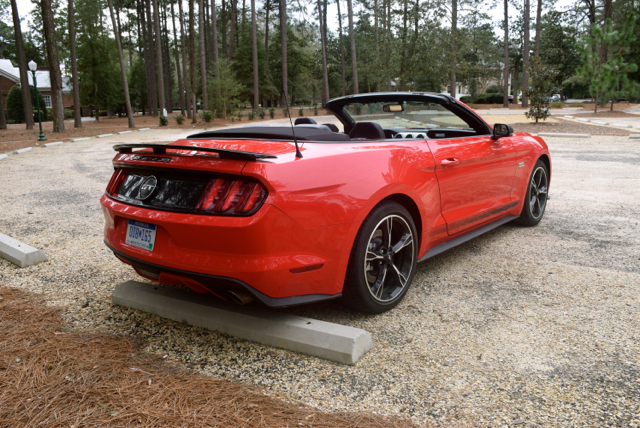 The Mustang’s reputation precedes it, therefore no special wheel composition is required. 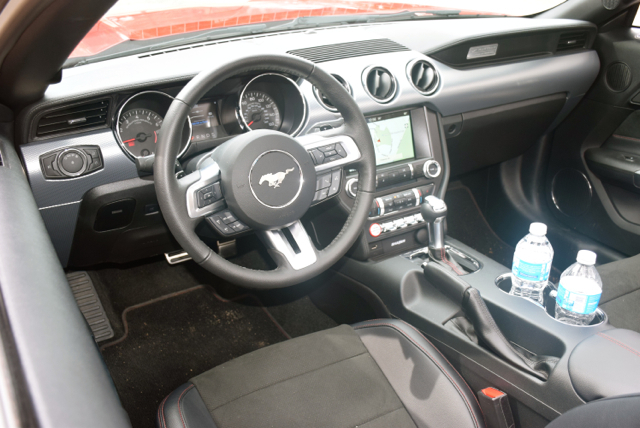 One feature that stands out and is entirely appropriate for the Mustang is a row of jet-like toggle switches near the base of the center stack and in front of the shifter. The first switch activates the emergency lights, the second switch is for traction control, the third switch heats the steering wheel, and the fourth switch controls the drive mode. Four drive modes are offered — comfort, snow/mud, sport, and track. I had the steed in sport mode almost constantly — track mode automatically disengages traction control and also activates launch control. Notably, the advanced modes also stiffen steering and increase throttle input, elevating this model’s performance characteristics to its optimum settings. 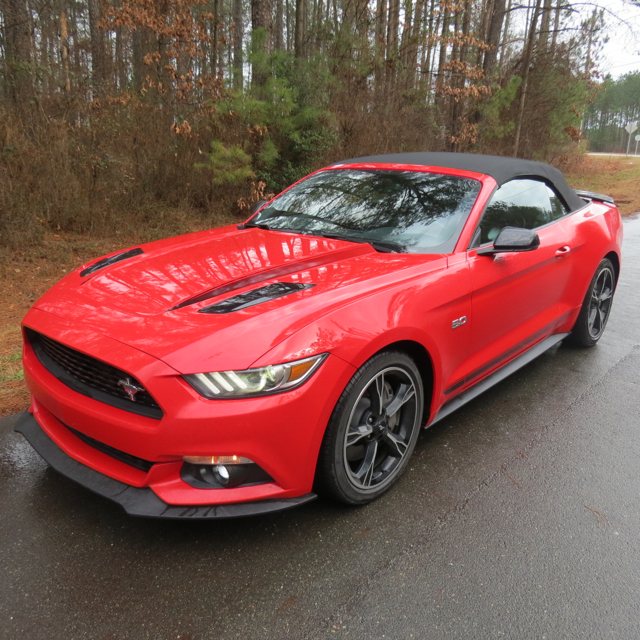 The Mustang GT is all about upholding the traditional American V-8 engine and doing so without forced induction. While a supercharged version along the lines of the Challenger Hellcat would be fantastic, Ford provides that option only through Hennessey Performance and then limited that number to just 500 units for the 2015 model year. Aim for scarcity and you’ll never sully the Mustang brand. Stomp on the pedal and the Mustang GT promptly complies. And just as it should. Immediately, you’re controlling the reins, guiding the stallion as you make your way down the road. Where American muscle cars of yore were strictly straight line beasts, the current iteration of this stallion does an admirable job of navigating the turns in a steady and confident gallop. To be sure, Ford did two things to the current iteration in an effort to reach a larger number of admirers. First, the automaker reworked the suspension system to make it fully independent, front and rear. Instead of battling the steering wheel to maintain control, you’ll sense the Mustang maintaining its poise and staying planted on curvilineal expanses. Second, the Mustang is now available in more than 100 markets, making it a truly global player. Thus, combining its expected straight line speed with Euro-type handling, makes this sleek conveyance more appealing elsewhere. In doing so, Ford likely also puts to rest once and for all that it’ll ever design a model like the second-generation Mustang. Or, worse, decide on a front-wheel drive platform. Quite frankly, it would simply be preferable to someday euthanize the Mustang than to emasculate all for a pretense to maintain its heritage. Fortunately, that’s a non-issue for now. 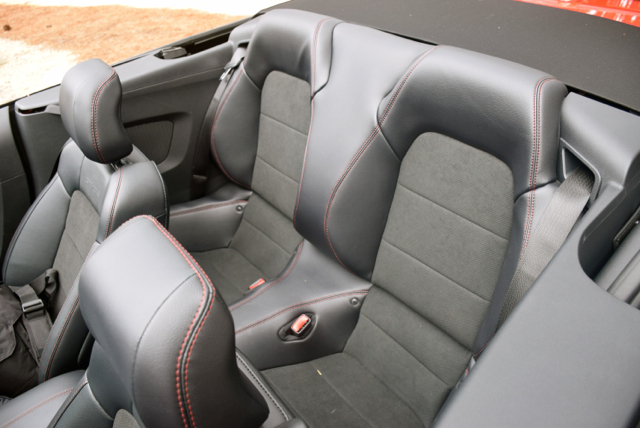 Dropping the top is as easy as turning the release handle and holding a high-mounted switch in place until the roof quickly descends into a tidy compartment behind the rear seat. Immediately, this model is transformed into a wind-in-your-hair sport coupe, ideal for those long and languid drives up the Pacific Coast Highway or for skirting around Pinehurst, the Hamptons or Palm Beach. 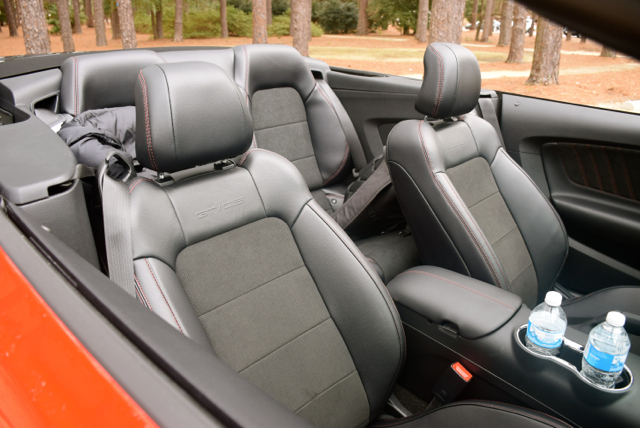 North Carolina’s winters are fairly mild, but not enough to enjoy the days with the top down for long. Still, with the conditions relatively calm and the sun breaking through the high clouds more often than not, dropping the soft top enabled me to take in the exhaust note and sense a stronger connection to the road. The rise and fall of the engine as well as every belch and toot of the exhaust system is amplified. Just look at yourself in a mirror as a silly grin now dominates your face. For 2016, Ford offers the current-generation Mustang in a host of trim levels with prices ranging from about $25,000 to near $50,000. A V6 engine is standard, a turbocharged four-cylinder is available, while the V-8 fills out the powertrain line. Personally, I would go with the most potent model of all, what best exemplifies the Mustang’s heritage while also managing to keep Camaro and Challenger at bay. Regardless of your choice, you’ll be fulfilling a dream that others have longed to attain. Ford Mustang GT Premium photos copyright Auto Trends Magazine.